This week: the house has been destroyed. These past few weeks have toppled to a spot where we shared some laughs, tears, and daydreams about Mississippi State in the playoff. The house is now condemned and will hopefully be restored before the beginning of next season. Maybe we can go to your friend’s house to watch the bowl games and TALK ABOUT FORDHAM FOOTBALL. Rivalry week was the last of the regular season for all of the Power Five conferences, with the glaring ONE TRUE EXCEPTION of the Big 12. This past weekend was a chance for teams to either continue their campaign for the inaugural College Football Playoff or play spoiler to those teams that are. In the words of college football analyst Jesse Palmer, it’s the time of the year where you “gotta throw the records out.” That didn’t exactly seem to be the case, as most of the favorites in each rivalry game maintained their dominance by smiting those for which they reserve the most ire. Out of 28 games, nine teams playing as the underdogs stood as the victors. One of those nine games was Mississippi’s upending Mississippi State’s chances of being one step closer to a national championship. Around the midpoint of the season, college football was infatuated with the state of Mississippi. The Bulldogs and the Rebels were cover story anomalies that seemed to be venturing towards a crash course in one of the biggest Egg Bowls in decades. It was refreshing to see two programs not named Alabama or Auburn hold the weight of the SEC world within their hands. Then, Ole Miss lost to LSU in the Bayou on a Bo Wallace interception that felt like cruel, cosmic punishment for a team that won one of their biggest games in years on an inaccurate pass by Alabama’s Blake Sims. The loss to the Tigers would be the first of three losses in a matter of four weeks. In the preceding weeks, they would lose a shootout to the Tigers and then become the second victim of the bottom feeding shark known as the Arkansas Razorbacks. Ole Miss’ chances to contend for college football’s latest prize were washed away in Week 13. Little Brother Mississippi State, on the other hand, still had a fighting chance, with only a loss to a Crimson Tide team that had slowly and quietly elbowed its way to the front of the line. 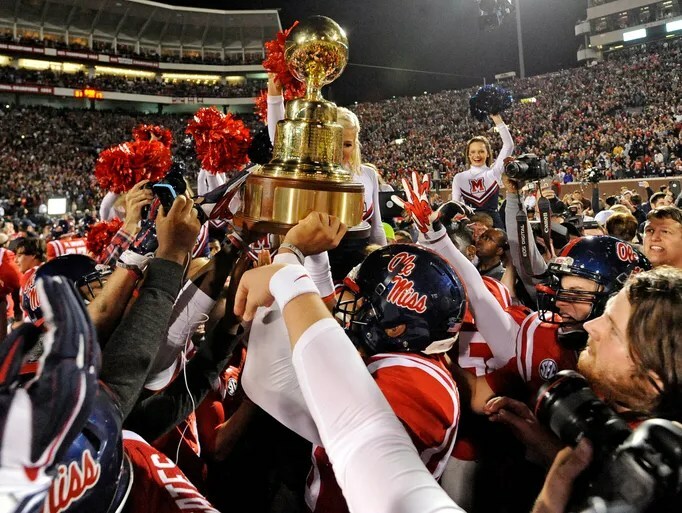 The Egg Bowl maintained its top billing but only by virtue of Mississippi State having acquired a fourth place spot in the playoff. The Landshark Defense was the constant for the Rebels’ key for victory as “Bad” Bo Wallace began to turn up more frequently. The Landsharks were able to hold Arkansas to four completed scoring opportunities out of five in the red zone. Three of those converted scores were on the legs of field goals, while there was only a single touchdown. Against Auburn, there was very little in the way of defense for the Rebels, as they allowed four touchdowns on five tries in the red zone for the Tigers. Nevertheless, Ole Miss was able to hold the Tigers to 42.86% of 3rd down conversion attempts while drastically improving to 16.86% against the Razorbacks. The Bulldogs’ potent offense, along with once Heisman hopeful Dak Prescott at the helm, were crushed under the weight of a Rebels team that had nothing left to play for other than a golden egg. Ole Miss forced the pressure on Prescott and held him to only one touchdown while giving up 330 yards. They were also able to jam the Bulldogs on third down by only allowing 8 of 21 conversion attempts, a marked improvement since the LSU game. The hosting school in Oxford won 31-17 in a game that even featured a Bad Bo interception. Now, Mississippi State has been relegated out of the upper echelon and back into a rejection pile that features the likes of Arizona, Kansas State, Missouri and Michigan State. The Sports Illustrated covers and endless sports blog features now seem to be something of a distant memory for a program that scrapped a random assembly of parts and rode it to stardom. MSU is watching as the world has returned to its natural course, with Alabama atop the pile and laughing manically. It was nice to dream for awhile. Paul Finebaum is a guy who enjoys cognitive dissonance. While the Egg Bowl certainly had implications for two teams competing from the SEC West, numbers suggest that you were certainly more interested in the Iron Bowl. Why wouldn’t you be? This was the crazed rivalry that gave you Scam Newton, Harvey Updyke and, most importantly, Kick Six – one of the wildest endings to a college football game in the history of the sport. The game itself was a flurry of points that bolstered Lane Kiffin’s run towards the Frank Broyles award. It also saw Amari Cooper catch 13 passes for an astounding 224 yards and three touchdowns. The Crimson Tide are certainly forming into the Trojans of Yore in the SEC under Kiffin’s scheming, but did you watch the other telecast of the Iron Bowl? Y’know, the one without Brent Musberger? On Saturday, the SEC Network decided to trot out an idea that catered to the callers of Paul Finebaum’s infamous, Alabama-centric radio show. It was called the Finebaum Film Room, and the premise was a live call-in show during the Iron Bowl that featured panelists Marcus Spears, Greg McElroy, Cole Cubelic, Booger McFarland and, of course, the self-appointed “Most Hated Man in the SEC,” Paul Finebaum. The show was designed to bring out all the crazies in the Yellowhammer State that the Iron Bowl could produce in order to boost the Worldwide Leader’s ratings. We at Tuesdays with Horry had other plans. Blog Lord Rory Masterson and I were watching the introduction of the ESPN telecast when we started talking about the call-in show. Rory, as you dear readers and fans of TwH know, went to Fordham University, a Jesuit institution in the Bronx and the alma mater of, among others, legendary football coach Vince Lombardi. I did not. Fordham is currently enjoying a cult following thanks to Dan Rubenstein and Ty Hildebrandt of The Solid Verbal who have used Fordham’s football team as a refutation of Rutgers’ claim as New York’s team. This quickly went from a small joke to a weekly Patriot League prediction segment on their show that was set to “stanky, nasty drum and fief.” With Fordham’s fast ascent from a 1-10 FCS team in 2011 to back-to-back FCS playoff appearances the last two seasons, the attention to Fordham has only increased on the show. As we switched the channel from Musberger’s dulcet tones to the sports radio format of Finebaum Film Room, we talked about the hilarity of someone calling into to yell at PAWWWWWLLLLLL about Fordham and how the Rams were advancing into the second round of the FCS playoffs after a 44-22 thrashing of Sacred Heart. Rory pointed at the screen where a graphic held up the number of the film room. I picked up my phone and started to furiously dial in. I got a busy signal each time I tried calling. As I wondered about all the crazy callers on the other line, Rory was able to get through the lines immediately, and he proceeded to hand the phone to me. A call screener quickly picked up the other end of the call and machine gunned the words “FINEBAUMFILMROOMWHAT’SUP.” In my best/worst impression of someone from Alabama, I told him that I was James from Dothan and that I wanted to talk about a touchdown that the Tide just scored after a turnover by Auburn. I threw in a celebratory “Roll Tide” in case dude had some hesitation about my Crimson credentials. I was put through the line, and I was granted about fifteen seconds of airtime. “James,” Paul Finebaum droned on the line. “What’s on your mind?” Oh, I’ll tell you what’s on my mind, Paul. Little did I know, I was the very first caller. Go Fordham. Go Rams. Go Bronx, NY. Earlier on Tuesday, Michigan finally gave the boot to Brady Hoke after a season that ended in another loss at the hands of Urban Meyer’s Ohio State Buckeyes. The Wolverines are 5-7 and ineligible for a bowl for the first time since Rich Rodriguez’s first year as head coach. The irony of that sentence is amplified when you consider that Rich Rod has guided the Arizona Wildcats to their first 10 win season since 1998. For flavor, I am also going to let you know that the same day Hoke was fired, Rodriguez was receiving a Pac 12 Coach of the Year award at a school without the prestige, money or facilities that Michigan has at its disposal. That’s not to say that Michigan fans should pine for Rich Rod to come crawling back. That has as much of a chance as a white person not getting indignant for being called a #MayonnaiseBoy. Rodriguez was rode out of Ann Arbor with many Michigan fans screaming that he was never legit and he would never win anywhere else. It’s nice to see someone vindicated after watching three years of people rolling their eyes every time he held a press conference. 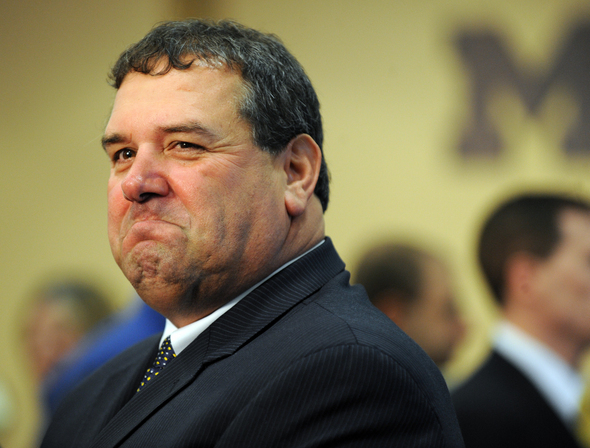 Maybe Brady Hoke will be able to coach a Power Five conference again in the future after figuring out what went wrong. Then again, maybe he won’t learn a damn thing from his experience and will still refuse to wear a headset. The firings weren’t reserved for the most obvious though. They also came at the expense of those who established good consistency. Like, 8-4 consistency. Bo Pelini was fired as the head coach of the University of Nebraska after leading the Cornhuskers to a 9-3 season. Through 7 seasons, Pelini amassed a 67-27 record with a bowl appearance in all seven seasons. However, the Huskers coach was without a conference championship in both the Big 12 and the Big Ten. Nebraska always seemed to be right on the precipice of breaking the ceiling until it didn’t. The result was a multitude of divisional titles but sparse national relevance. Nebraska AD Shawn Eichorst broke the news on Sunday via e-mail, to the outrage of both current and former players. The Huskers are now looking for a coach who is able to bring them back to 1995 or, maybe they keep some people in a cryogenic freezer every few years to let thaw and win national titles. The best game of last Saturday was easily Georgia-Georgia Tech. A game that almost in regulation with a Georgia touchdown with only 18 seconds left to play only to be forced into overtime via a 53 yard field goal courtesy of the Yellow Jackets’ Harrison Butker. The Jackets would go on to score first in overtime and then intercept the Bulldogs on the next ensuing possession. Georgia Tech is now 9-3 and heads to Charlotte to face Florida State in the ACC title game. Florida State defeated Florida 24-19 in another way too close for comfort game for a team who is 12-0 and now ranked at the bottom of the playoff barrel. It was Will Muschamp’s last regular season game as coach of the Gators, and it got the press conference it deserved. Ohio State’s 42-28 victory over Michigan was not without the loss of their key play maker, freshman QB JT Barrett. Barrett broke his ankle in the 4th Quarter and will remain out for the rest of the season. This does not bode well for the Buckeyes who head to Indianapolis to take on Wisconsin for the Big Ten Championship. TCU stomped a resurgent Texas team in a 48-10 rout. The game helped bolster the Horned Frogs to the College Football Playoff along with a poor performance by Florida State. Baylor, while having some trouble maintaining Texas Tech, managed to pull out of Arlington with a 48-46 win. Also, another reason for TCU’s ascendance. In a 38-10 thumping of UCLA, Stanford reasserted that while down they are not out. The Bruins had a miserable day with Brett Hundley only accounted for 146 yards and one touchdown while the struggling Kevin Hogan ripped off 234 yards and two touchdowns against what many thought was a formidable defense. Oregon rolled over Oregon State 47-19 and toward Levi’s Stadium where they will play in a rematch against Arizona for the Pac 12 Championship. USC crushed Notre Dame and ran the jeweled sheleighly in a 49-14 beatdown. Things got chippy in the Louisville-Kentucky between players and then, ultimately, coaches. Louisville would go on to win the war with a 44-40 victory. Illinois beat Northwestern and is now bowl eligible for the first time since 2011. Surely, they will give noted town drunk Tim Beckman an extension.